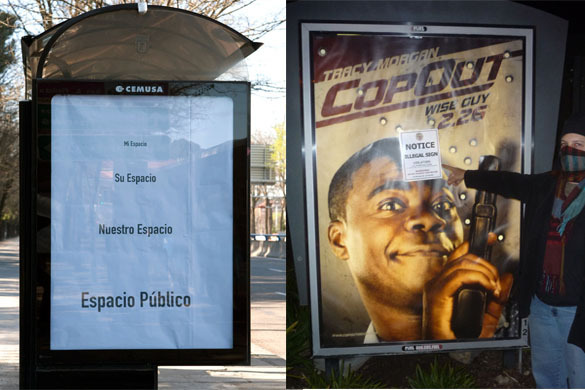 The Renegade Sign Bandits, the anonymous group that plastered illegal signs with official-looking violation notices more than a year ago and then wasn’t heard from again, surfaced last week as part of a guerrilla action that replaced more than a hundred ads with text posters in Madrid bus shelters and items of street furniture. The group, which took its name from a remark made by an official with L.A.’s building department, has a new website, but what might be next on its activity calendar is anybody’s guess. For an LA Weekly interview last year with one of the “bandits,” click here.